In this article we’ll share the 3 main strategies we use to help clients fix a “broken diet” and start eating better. We’ll also share how we troubleshoot eating plans when they’ve “just stopped working” and you don’t know what else to try. And, finally, we’ll show you how to use these powerful and purposeful strategies to improve your own eating. Or to help others do the same. Listening to their needs and what they want to accomplish. Discovering what’s really important to them. And then working together to create the right nutritional approach for them, a diet that’s personal and unique, based on their goals and lifestyle. Another thing that good nutrition coaches do to help their clients? Observing their progress carefully and correcting course as necessary. Here’s why: Every diet system is going to stop working at some point. No matter how great it seems initially, that diet will break. And when it does, your next step is crucial. So, in this article, I’ll help you figure out how to get started when your diet feels broken. I’ll also share exactly how we troubleshoot nutrition plans when “they’ve just stopped working”. And then I’ll teach you how to do it all yourself. First, though, a disclaimer. I’m not going to give you a set of rules to follow. Or even share a specific diet philosophy. Instead, I’m going to share a framework for evaluation. This way, if you follow a Paleo diet, you can learn to Paleo better. If you’re a vegan, you can learn to do that better too. And, if you’re just getting started with eating healthier, you can start out right, without wasting time and energy. I don’t know about you, but I get exhausted just thinking about changing all this, all at once. Let’s call it the “Mission Impossible” approach. After coaching over 20,000 clients in the last few years, I’ve come to realize that the Mission Impossible approach isn’t just difficult; it’s misguided. Because a complete overhaul rarely addresses what’s making most people feel bad in the first place. Often, people struggle with how they look and feel because their physiology doesn’t work the way it should. This can be hormonal imbalances, but it’s more often dietary deficiency: not getting the right nutrients, in the right amounts, to get the best results. Dietary deficiencies, therefore, are the first red flag that something’s wrong. The research in this area is pretty telling. A study published in the Journal of the International Society of Sports Nutrition showed that it’s really hard to get all the essential vitamins and minerals from food alone. This study analyzed 70 athlete diets. Every single diet was deficient in at least three nutrients. Some diets were missing up to fifteen nutrients! The most common deficiencies? Bottom line: Dietary deficiencies are very common. Chances are, you’ve got one, no matter how good you think your diet is. That’s a problem because when you’re deficient in key nutrients, your physiology doesn’t work properly. And when your body doesn’t work as it should, you feel rotten. Energy levels, appetite, strength, endurance, and mood all rely on getting enough of these essential nutrients. When you don’t get them, things break down. That’s why you can eat “clean”, go Paleo, avoid meat, lower your carbs, or count calories – you can do “everything right” nutritionally – and still feel lousy. You need to identify your red flags from the very beginning and start eliminating them, one by one. Without any other advanced screening or dietary changes, our clients quickly start feeling better. They lose fat and gain lean muscle. They feel more motivated. And their workouts become easier and better. Here’s just one example (of many): Research in the British Journal of Psychiatryshows that providing fish oil and a multivitamin to prison inmates reduces aggressive and violent behavior by 35% and decreases antisocial behavior by 26%. Also, a paper published in Nutrition Reviews shows that giving children fish oil and a multivitamin improves both their behavior and intelligence scores. (Who doesn’t want a smarter, better-behaved kid?) That’s the power of removing nutrient deficiencies. When our bodies don’t have the nutrients they need to do their work, we all suffer. But as soon as we get these nutrients, we thrive. In our fat loss and muscle gain coaching programs we help clients get away from using handbooks, websites, databases, spreadsheets, and math when planning meals. You see, while we know that total food (calorie) intake matters, we’re just not fans of counting calories. To begin with, calorie counting does nothing to help us tune into our own powerful hunger and appetite cues. By learning how to listen to our own bodies, we have better long-term success in healthy eating. Because of incorrect labeling, laboratory errors, and differences in food quality and preparation, calorie counts recorded on food labels and websites – even those within the USDA’s nutrient databases – can be off by as much as 25%. Bottom line: even if you’re the world’s best calorie counter (and you don’t mind the soul-sucking boredom that comes along with it) the math just doesn’t add up. 1 – 2 thumbs of fat dense foods if including extra fats. 1 thumb of fat dense foods if including extra fats. Men in our Scrawny to Brawny program (who want to add mass fast) might get 2 palms of protein dense foods at every meal, and — what the heck — throw in another thumb of fat or cupped handful of carbs. But men in our Lean Eating program (who want to lose fat) might scale down to 1 palm of protein, 1 thumb of fat, and 1 cupped handful of carbs, eaten slowly and mindfully to “80% full”. Of course, just like any other form of nutrition planning – including detailed calorie counting – this meal template is just a starting point. You can’t know exactly how your body will respond in advance. So stay flexible and “steer dynamically”. Adjust your portions based on your hunger, fullness, overall activity level, and progress towards your goals. Start with the basic template and then adjust your portions at any time using outcome-based decision-making, aka: “How’s that working for you?” For more on this idea, including photo examples, check out our calorie control guide for men and women by clicking here. Most people can simply eliminate nutrient deficiencies and get food portions and quality right, and stop there. Small adjustments in those two areas – and nothing more – will make a huge difference in how 90% of folks look and feel. Simple. Easy. However, for those who want to go further – because they have more advanced goals or because they’re already doing the first two and still struggling – let’s talk about food composition. At Precision Nutrition, we have a really simple shortcut for helping people “eat right for their body type”. I types therefore generally do best with more carbohydrates in the diet, along with a moderate protein and lower fat intake. So that’s what we recommend: more healthy carbs and less fat with a moderate amount of protein. A nutrient distribution for this body type might be around 55% carbs, 30% protein, and 15% fat. (But don’t drive yourself crazy with the math. Just think “higher carbs and lower fat.”) Here’s what that might look like using our portion control guide. 1 thumb of fat dense foods with each meal. Portions for men, I type. 0.5 thumb of fat dense foods with each meal. Portions for women, I type. V types therefore generally do best on a mixed diet, with balanced carbohydrates, proteins, and fats. So that’s what we recommend. A nutrient distribution for this body type might be around 40% carbohydrate, 30% protein, and 30% fat. (Again, don’t drive yourself crazy with the math. Just envision a roughly balanced mix of all three macronutrients.) 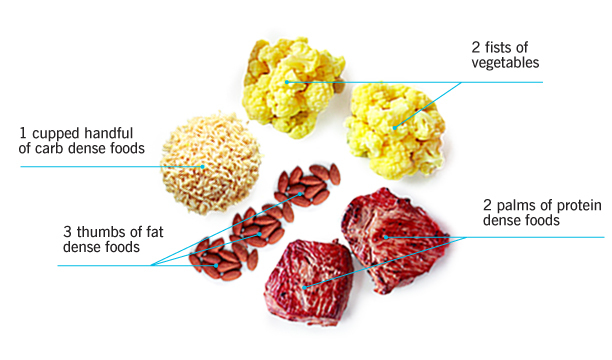 Here’s what that might look like using our portion control guide. 2 thumb of fat dense foods with each meal. Portions for men, V type. Portions for women, V type. 3 thumbs of fat dense foods with each meal. Portions for men, O type. 2 thumbs of fat dense foods with each meal. Portions for women, O type. Remove red flags and nutrient deficiencies. Control your calorie intake without counting calories. Adjust your food composition based on your body type. In the grand scheme of things, everything else – meal frequency, calorie/carb cycling, workout nutrition – is just a minor tweak. A very minor tweak. But let’s address them anyway. From early research we assumed that this would speed up the metabolism, help control the hormones insulin and cortisol, and help better manage the appetite. However, a recent review in the Journal of the International Society of Sports Nutrition suggests otherwise. What this means is that as long as we eat the right foods in the right amounts, meal frequency is a matter of personal preference. You can eat lots of small meals each day (i.e. every few hours). Or you can eat a few big meals each day (i.e. with bigger time gaps between them). Now, my advice is: Listen to your own body and apply the “how’s that workin’ for ya?” test. If you’re covering all your other bases and your current meal frequency isn’t “workin’ for ya”, try switching it up. Experiment with fewer meals if you eat more frequently. And more meals if you eat less frequently. Because either approach is valid, you’re free to find the approach that works best for you. Whether your goal is to lose weight, build muscle, see your abs, or get back in shape, carb and calorie cycling can make a real difference. (I know I’m going to sound like a broken record here, but it’s worth repeating. Pleasemake sure deficiencies are eliminated, calories are controlled, and macronutrients are aligned appropriately – and that you’re doing all of this consistently before considering any of these fine-tuning strategies.) While it may have a fancy name, carb cycling is simply eating more carbohydrates on some days – usually on high volume or high intensity days – and eating fewer carbohydrates on other days – usually low volume, low intensity, or off days. We focus on carbohydrates (and not protein or fats) because carbs seem to influence body composition, how you look, and how you feel the most. By changing carbohydrate and therefore calorie intake on particular days, we can keep fat loss going and metabolic rate humming along, without the ill effects of stringent calorie or carb restriction. The carb and calorie cycling approach is pretty simple, and based on your activity. And that’s pretty much it. No need to measure grams or count calories. Just follow a baseline diet on lower carb days. And add carbs on higher carb days. For more on this idea, check out this All About Carb Cycling article. Or this excellent article on cycling carbs for muscle gain. Just remember this: Removing deficiencies, controlling calorie intake, and beginning eating for your body type – and doing this all consistently – must come first. If you haven’t done those first, this strategy usually backfires. What should you have before, during, and after your workout? That’s a valid question. But it really doesn’t matter for anyone but an elite athlete training specifically for maximal muscle adaptation, and/or training with high volume and intensity (potentially multiple times every day). If that’s you, then yes, eating an appropriate meal about 2 hours before training or competition may be important. And — might I gently remind you — done all the above consistently. Yes, every day. Over and over and over. Then if you’re still looking for a little boost, my best recommendation is to continue to eat normally around your workout. And use a simple branched chain amino acid (BCAA) supplement. 5-15 grams mixed in 1 liter of water and sipped during an exercise session should do the trick. First, remove red flags and nutrient deficiencies. Consider your body type and activity level. Observe your progress carefully. Adjust your intake as needed. Do all of this consistently and long-term first, before adding any new strategies. Remember, whether you’re a beginner and trying to get started in the right direction, or you’re experienced but still spinning your wheels, these steps – when applied in sequence – can make all the difference.